The department encourages Schreyer Scholars to major in Sociology or Criminology and individual faculty are eager and willing to work with Scholars. Most Scholars complete two or three Honors Options courses in their major during their junior year-with an eye toward finding a subject and/or an adviser for the senior thesis. A few students are even able to turn Honors Options work into the beginning of a thesis project. Schreyer Scholars in Criminology and Sociology complete a one-credit honors seminar during the fall of their junior year. In this seminar, Scholars read a number of earlier honors theses and meet faculty members in order to learn about their areas of interest and current research projects. In the spring semester of the junior year, Scholars also complete a one-credit seminar. Working with the department Honors Program Director and one faculty member of their choice, they use this seminar to specify a topic for their honors thesis and begin doing a review of the literature on that topic. Most of the work on the honors thesis itself is done during the senior year. Scholars are sought after for departmental teaching and research assistantships, and these experiences are an important component of the Scholars program. Most Scholars find it easy to establish one-on-one relationships with Sociology and Criminology faculty. If you have questions about the Honors Program in the Department of Sociology & Criminology, contact Dr. Stacy Silver, sjr111@psu.edu. 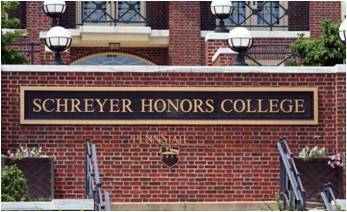 Consideration for admission to the Schreyer Honors College is based on a separate and independent application to the Schreyer Honors College. Go to Schreyer Honors College for information about the college and the admissions process.